There are lots of reason to install Custom ROM over Stock ROM. So If you have an Android device and want to modify or customize your device then you should need to know about the Custom ROMs. 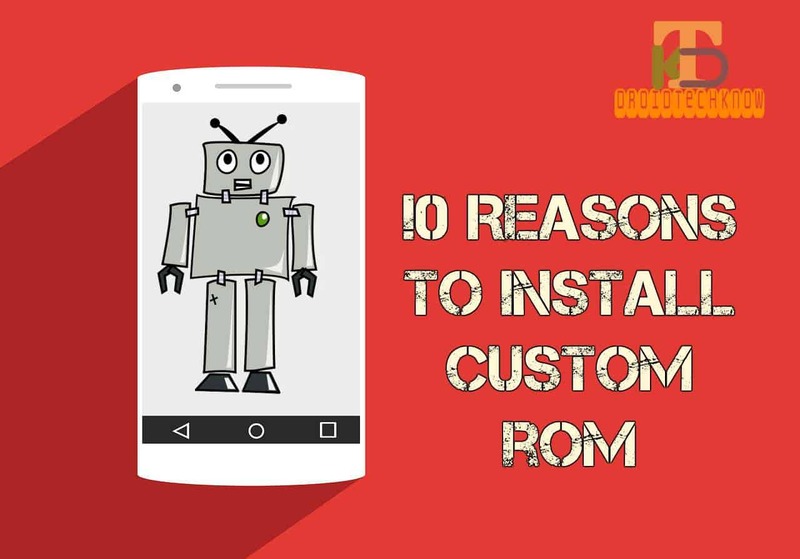 Before discussing more detail about Custom ROMs let first discuss what is ROM and Stock ROM. ROM(Read only memory) is an Operating system for your Android device which is stored in read-only memory. Stock ROM: Stock ROM is an operating system which comes by default on your Android device. Stock ROM manufactured and maintained by the mobile company. Custom ROM: Custom ROM is modified version of Stock ROM which is developed by open source community. Custom ROMs is more popular due to its performance and its appealing look. It provides us to customize our Android device according to our needs. There are also lots of amazing features of Stock ROMs and Custom ROMs but for now, we will only discuss the custom ROM features. When you buy a smartphone it comes with some preinstalled applications which company provide you. They provide you with some their application for texting, gaming, watching music and other things. You can only disable the application but not access to completely removing it. So Custom ROM provides us to remove unnecessary applications which are no use. Due to its open source community, the code did not go through different people of the cycle. When a developer writes the code then it should be tested on the real-life environment(beta testing). This means the time for bug fixing and adding new features required less as compared to Stock ROM. Open source community keeps updated the code so frequently with the new functionalities. Custom ROMs are much faster, efficient and consume less memory than Stock ROMs. It riped out the useless garbage which consumes memory size(RAM). The main performance factor for every device is their running applications. In Stock ROM you can't stop or uninstall the preinstall applications which running always in the background. But in custom ROM you can increase your device speed by uninstalling or stopping these applications which running all the time in the background. With the help of custom ROM, you can easily install the latest version of OS that has not been released for your device. Open source community is more powerful they convert the custom ROM so that it will work on your device. So you have not wait for the release of latest version of Android which works for your device. Just install custom ROM on your device and enjoy the Latest version of Android. When your phones run out of memory due to installed applications then what should you do? One way is to just uninstall your Stock ROM and ready to install the custom ROM because Stock ROM does not provide you to install the application on your SD card. Now, most of stock ROM comes with the ability to install applications into the SD card. If you bored with your Stock ROM mobile UI and want some attractive UI then its time to install custom ROM. Custom ROM change the whole user interface of your device which looks very attractive. Different Stock ROMs have their own User interface. Your mobile phone battery life also increases because now you had been removed unwanted applications which runs always in the background. As a result, user witness the long life of battery after installing the custom ROMs.